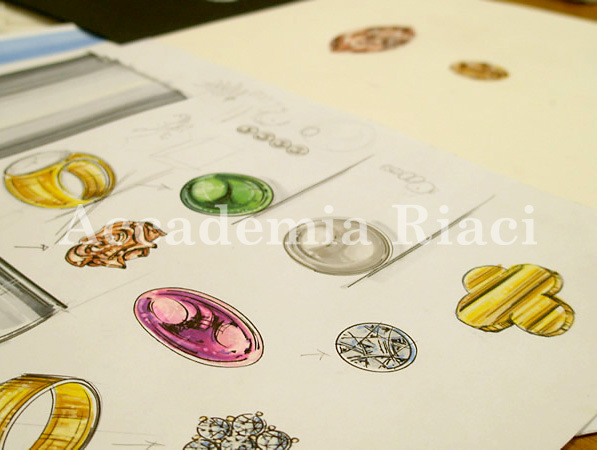 Jewelry Design standard course is held 3 times a week, each lessons is 3 hours. 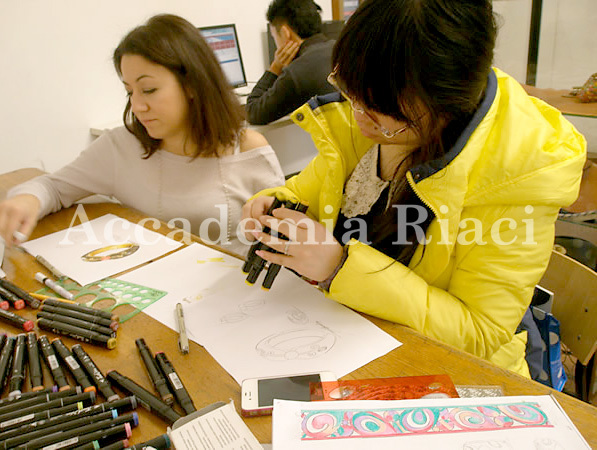 Also　many students of jewelry Making participate to 20 hours of Design classes, in order to gain a wider understanding of Jewelry. 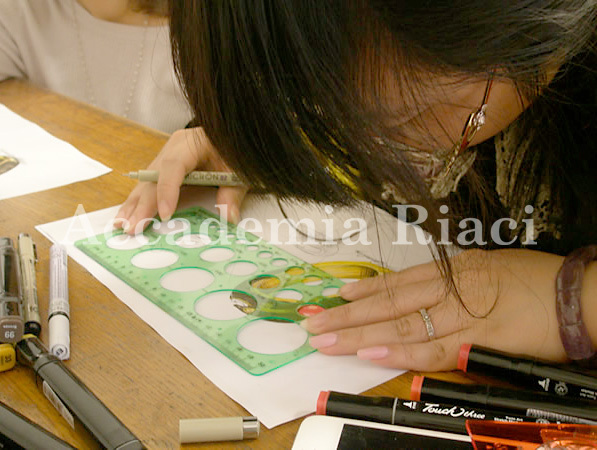 The first thing that students learn to do is 2D design using pencils. 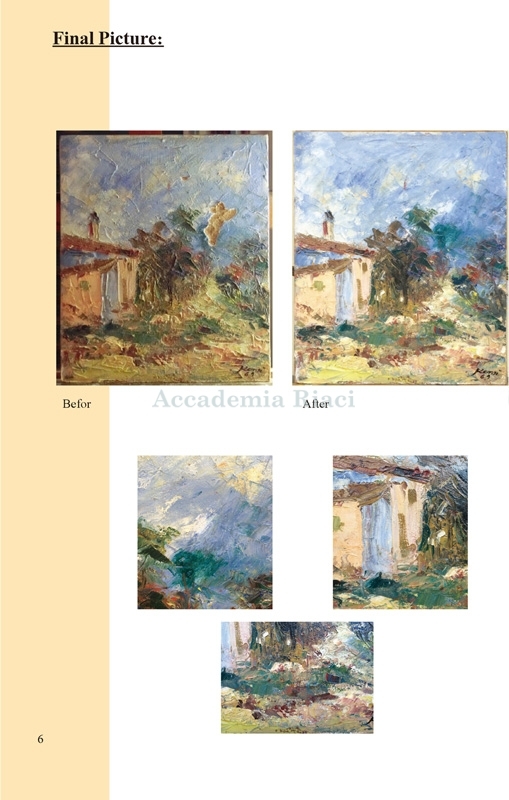 They sketch as many images as possible and then choose the best one to develop the two-dimensional design with the precise size of the planimetric representation – through orthogonal projections and measuring. Once the 2D design is completed, it’s time to proceed to the 3D representation. Professor Annalisa explains that when she was a student she was assigned to draw a 4cm circle without using the curve ruler, as homework. She practiced every day for a whole week and by the time she was able to draw it precisely, she had almost finished a pack with 500 sheets of paper. 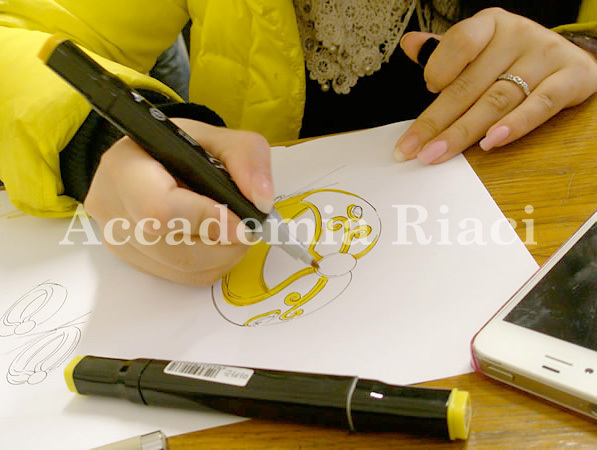 This was a special training to learn how to move the wrist smoothly, and so be able to draw accurate circles quickly. 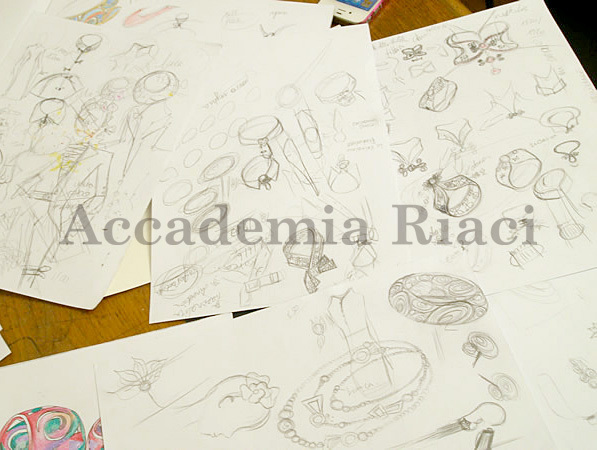 Here are many sketches that reflect the richness of the student’s imagination. 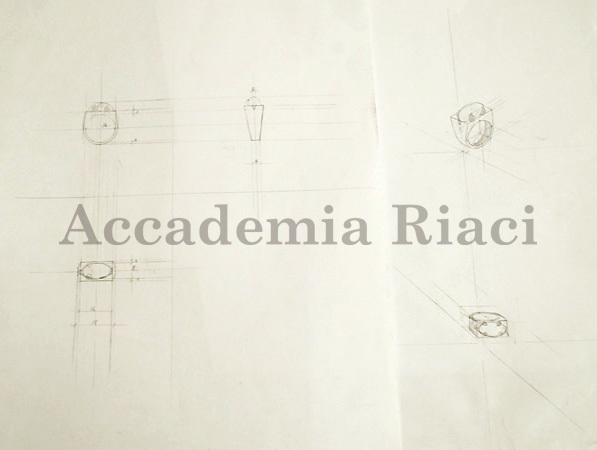 On the left the 2D sketches, on the right the 3D representations. As these are the technical designs (blueprints) of the product, there are detailed directions how it should be realized. The next step is adding colors to the design. 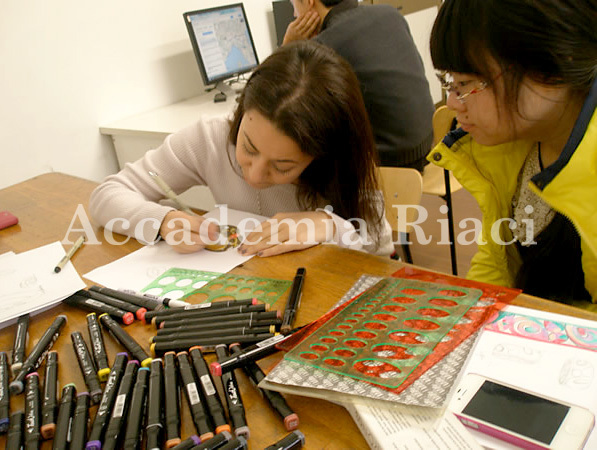 In order to apply the colors, students draw a magnified version and take photocopies for practice. There is no rule on whether to use color pencils or color pens, so students learn to use both, and then choose the one they prefer. Today, the student is practicing color with pens. Prof. Annalisa explains how to do it, while showing a sample. In the case of pens, if your hand slows down or stops moving, the color will easily drip, so it’s important to do it fast and quick. In order to acquire this skill it’s essential to practice a lot. Students also need to use both thick and thin nibs. 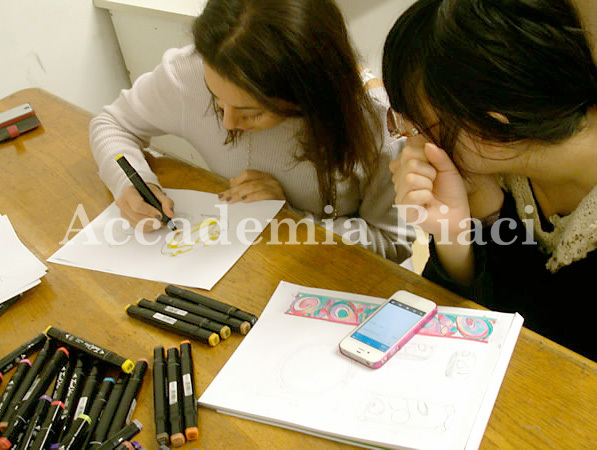 Prof. Annalisa is showing an example of design. Speed is the key, in order not to blur the lines. 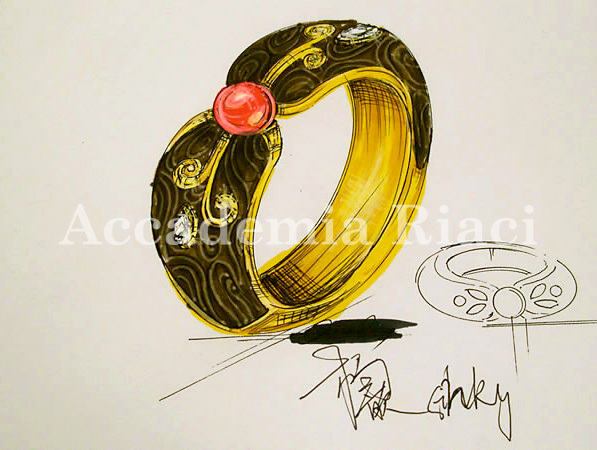 The design is completed, by adding the brightness of the metals and stones using a white pen. This application of white color also is very important point. 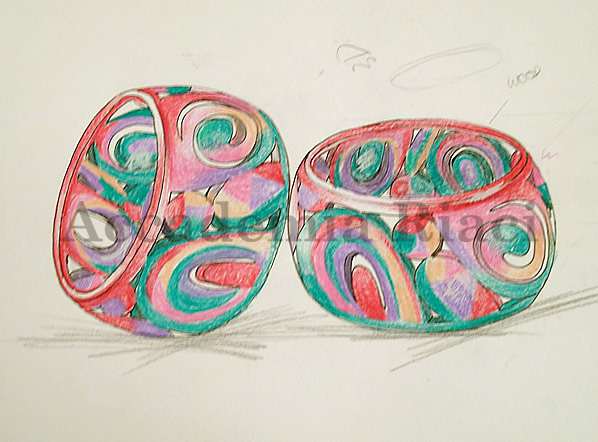 Design colored with pencils. Notice the difference of the texture from the ones colored with pen. 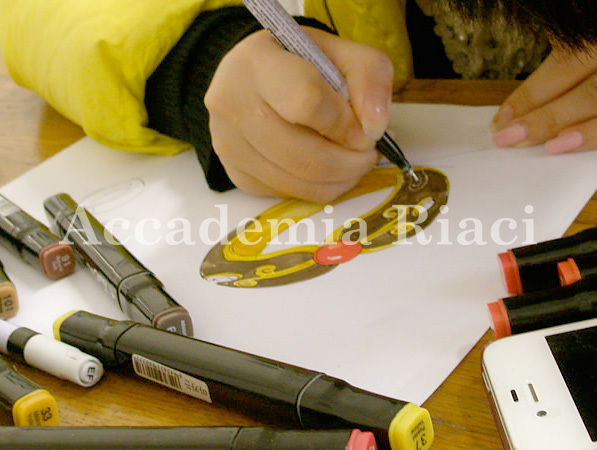 The student selects which yellow most appropriate to represent the gold base of the jewel. 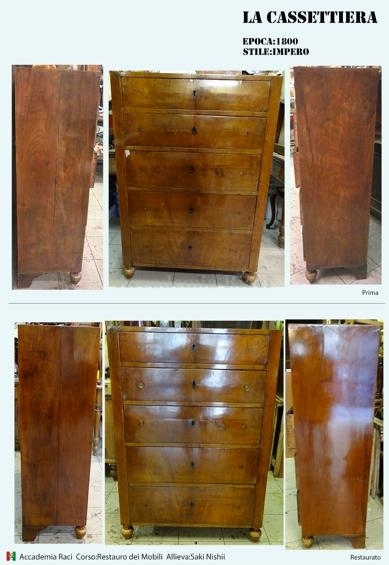 The student wants to combine gold with wood, so the wooden part is painted in brown color. 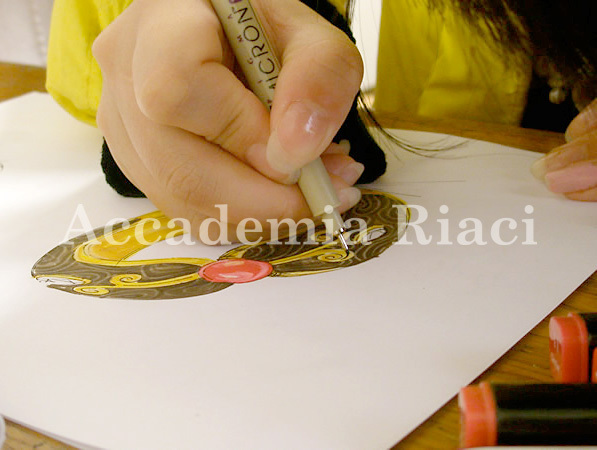 The external parts and the shade parts have to be expressed with a black pen with thin point. 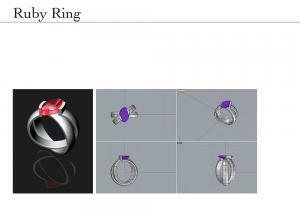 A white color pen will express the light reflection and color gradation of the coral, chosen as the main gemstone of the ring. If necessary, a ruler can be used. The project accomplished! With the author’s sign.